2015 in review for JewishDC! But before I herald out the secular year, a few notes on activities from December! On Tuesday, December 8, I was at Sixth & I for an awesome, soulful, dance-y concert (made it in juuuust before getting sick with a bad cold. :D) The group in question was Bulletproof Stockings, a chasidic alt rock girls band from Brooklyn, on their first regional tour! I was able to cobble together a little teaser vid of the event; you can watch it here. A week later, on Tuesday, December 15, I was back, at the DCJCC this time, to watch more New Yorkers (or close enough, at least, since they work for Tablet Magazine) visit the capital–the hosts of their podcast, Unorthodox. It was a rowdy, fun night, featuring such guests as Jewish food guru Joan Nathan, journalists Elizabeth Bruenig and Adam Kredo, and songwriter Jeff Knable. Also lots of great interaction with the audience, but alas, most of that got caught in the final show. Still very much worth checking out! It’s been a great year for me, as I hope this blog indicates. 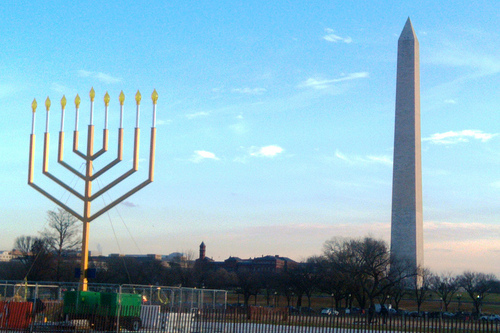 I look forward to being back in 2016 to cover more DC-area Jewish events! Happy holidays.